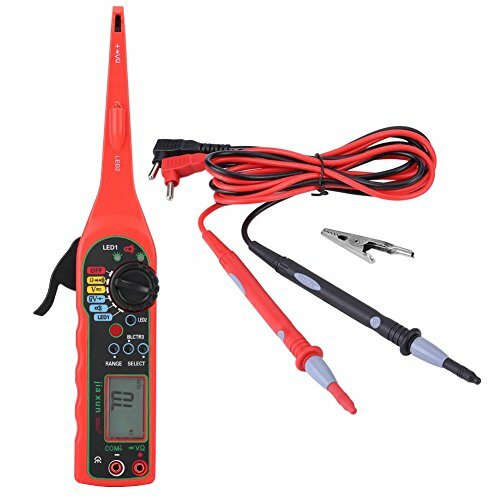 This item is the only four-in-one product with the functions of multimeter, test lamp, lighting lamp and probe. All functions of digital multimeter are intelligent. Backlight is closed automatically after the backlight of 30s. All ranges are intelligent, and the instrument shuts off automatically after the stop of use for 20min. Bring it home and make your repair work easier and safer. It can quickly and accurately detect various line faults under the situation of no damage to rubber cover. Support short-circuit and open-circuit test, ignition system test, generator test, charging system test, input and output signal of sensor test, executive component signal test, pulse signal test. With multimeter functions (voltage, resistor, diode, buzzer, etc.) Specially detects the wires with bad contact and aging wires. Can detect each fault in the place where the space is narrow and light is weak. With multiple test lamps. Also with a lighting lamp, convenient for night use. It is convenient to use, efficient to detect, easy to operate and has reliable performance. Widely used in automotive electrical decoration, such as the installation of anti-theft devices, audio, subwoofer, etc.